I hope that you are not getting tired of my glitter house posts. 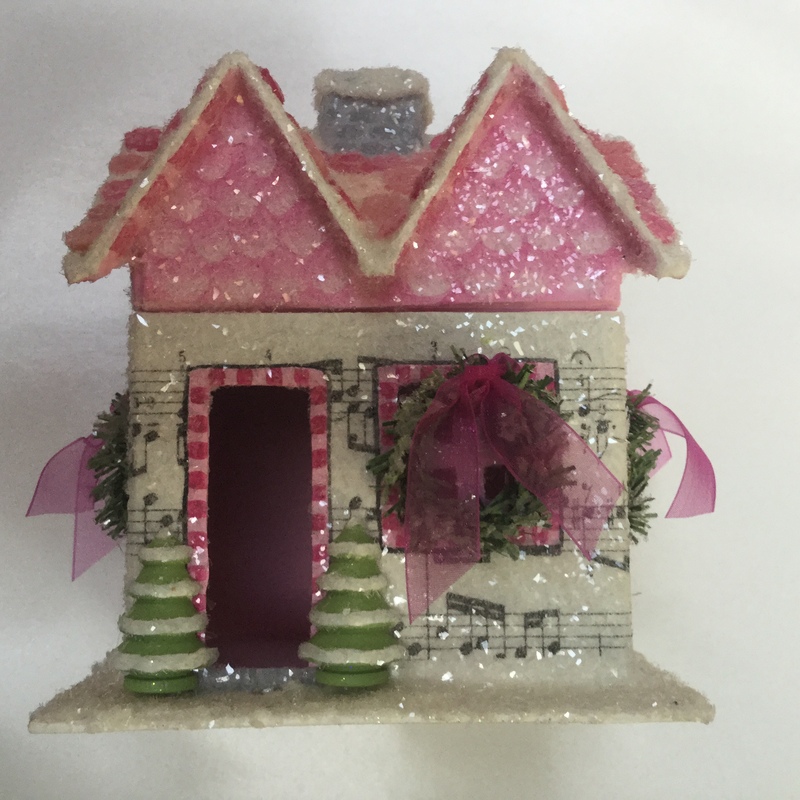 I have been teasing you with this Music Glitter House and feel that it could be nice for winter. I started by painting the bottom of the house and my roof Snow White*. I used a tissue music paper from Tim Holtz and glued that over the bottom of the house making sure it was carefully sealed around doors and windows . This style is no longer available but Tim Holtz does make a similar style that also has butterflies called Melange. I would just use the music sections of the paper. You could also use music scrap book paper, a music stamp on tissue paper, etc. Once dry, paint inside of house, top of house and under eaves with desired color (Poodleskirt Pink*). Cut paper out of windows and doors with exacto knife. Paint frames around doors and windows the same color as the inside. Paint chimney Slate Grey*. Using small flat brush paint checks around windows and doors with coordinating color. Use a larger flat and paint checks under eaves. I used Royal Fuchsia*. Line around windows with Black Permanent Ink marker. I used a Faber-Castelle. I freehanded clapboard on top of house with liner and darker color. Highlight bottom of each board with white and shade back with darker color. Use small flat and darker grey (Neutral Grey*) to paint bricks on chimney. Paint step darker color grey. Now for the fun of adding the buttons. Use a palette knife to add snow-tex * to a portion of the roof at a time, then add buttons. Add snow-tex to top of chimney and base of house. Allow to completely dry. Add glitter to entire house working a section at a time. After glittering add your embellishments. Here are some other houses that I added buttons to the roof. Notice on the larger house I had the buttons stand up on top of roof line. I also did this on the pink one in the next picture. Hope you enjoy creating this project. * I am using DecoArt Paints. Your glitter houses are so cute! and look so fun to do! Love your close up photos and how to’s. Thanks for sharing! Thank you Linda, I love sharing the joy of creating with others. I feel this is one of the things God is nudging me to do this year. Looks wonderful Jane….keep on glittering! Thank you Amy…there is just something about glitter…about the bling. Love your glitter house, your ideas are inspiring. Keep up the posts. Thank you Joyce, knowing others want to see them keeps me motivated. I have a lot more ideas. Jane I LOVE your glitter houses! Where can I find the cardboard houses and the little wooden trees? Hi Kathleen, you can get the houses at hobby lobby and the wooden trees are from Bear with Us, Inc. Glad that you love the houses they are fun to make.